"My easy recipe is an old favorite that we keep in steady use from mid-November until the New Year. Homemade gifts are still a Christmas tradition at our house." Sprinkle almonds on a greased 15-in. x 10-in. x 1-in. baking pan. Bake at 300 degrees F for 15 minutes or until toasted and golden brown; remove from the oven and set aside. In a saucepan over low heat, cook butter and sugar for 5 minutes. Add water and corn syrup. Bring to a boil over medium heat; cook, stirring occasionally, until a candy thermometer reads 300 degrees F (hard-crack stage). Quickly pour over almonds. Sprinkle chips on top; let stand for 1-2 minutes or until melted. Spread and swirl chocolate over candy. Cool completely; break into pieces. I didn't think this tasted that good at all. I also think if you do make it, it needs to be kept refrigerated or else it gets really gooey and runny. This is a much better way to fix this candy. 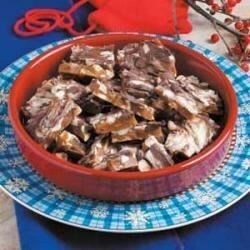 By putting the almonds under the toffee rather than sprinkling on top of the melted chocolate keeps all of the almonds in the candy. Great idea!